Race record: 3 wins, 4 places, 1 show from 15 starts, for earnings of $970,500. Won 2006 Lane's End Breeder's Futurity (gr. I) and 2007 Robert B. Lewis Stakes (gr. II). Big Draw: a near-millionaire, juvenile grade I-winning son of hot sire Aptitude (SRO). Thoroughbred female family: 2-d, the Almahmoud family of Northern Dancer and Halo. Big Draw: Young half-brother to Danehill (pedigree), the now-deceased European high-weighted runner and frequent leading sire (in Australia, France, England, Hong Kong, and Ireland). We'll switch gears today to discuss the sale of stallion prospects. Keeneland's November sale offers 23 stallion prospects and an additional 115 racing/stallion prospects, while Fasig-Tipton has just one hip offered in this category. Top-tier stallions are generally retired to stud in one of three ways: by the owner, by a syndicate, or by private sale to a stud farm. Every year, though, many marginal horses and a few higher-end prospects are put through the ring. Some will wind up as the house stallion for a smaller farm, others will become commercial stallions in a regional market, and a few will be marketed as commercial or breed-to-race sires in larger breeding markets. Great Hunter's juvenile scores and his ability to mature to distances over a mile are both points in his favor, as is the success of his sire, A.P. Indy (SRO)-line stallion Aptitude. 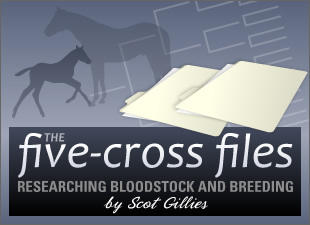 I'd guess offhand that Great Hunter finds a home in a large breeding market, with opportunities to cover mares from a multitude of genetic backgrounds. It's not easy to choose mares for him, though, without running into substantial inbreeding. Great Hunter is a Seattle Slew-line stallion out of a Mr. Prospector-line mare, and is inbred 3 x 4 to Northern Dancer. Add to that several crosses of Buckpasser, and it's clear that this stallion's new owner will want to look for some outcross mares. I'd suggest Holy Bull (SRO) and his sons, especially Giacomo (SRO) and Flashy Bull (SRO). Earth Planet is more likely to become a farm stallion outside of mainstream commercial breeding. He didn't prove greatness on the track, but he descends from the blue hen mare Razyana, making him a young half-brother to the successful sire Danehill. I'd want to see Earth Planet paired with mares carrying Northern Dancer left, right, and center. Not only is his half-brother, Danehill, a Northern Dancer-line stallion, but every grade I winner by his own sire, Distant View, had Northern Dancer-line sires and/or broodmare sires. It also gives a great opportunity to capitalize on the proven Rasmussen Factor inbreeding to Natalma. Any smaller breeders out there with a large population of mares rich in Northern Dancer blood but lacking Mr. Prospector lines? Here's your opportunity. What type of program do you see these stallions fitting in to? What mare population / bloodlines would be the best pick for them?